← Gordon County, Georgia. January 14th, 2011. 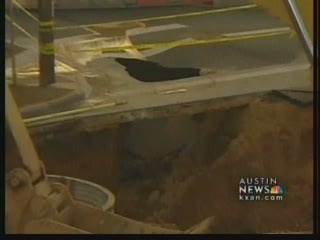 AUSTIN (KXAN) – What started as a crack in the street on the corner of Cesar Chavez and Mildred streets soon developed into a nine-foot deep, intersection-wide hole in the middle of the intersection. City contractors worked at the location last month to fix a storm drain. They just finished two weeks ago, when the road swallowed up an unassuming driver late Sunday night. “Right now we have a 12-inch water main that has failed. There has been some kind of break in it which caused the undermining in the sinkhole,” said Simon Orta, construction inspector for the City of Austin. The driver of the car was shaken but not seriously injured. City officials aren’t exactly sure what caused the break or where it is in the pipe, but they’re not ruling out Sunday’s heavy rains, or another theory: that perhaps the pipe was nicked during construction for the storm drain last month. Orta said he was surprised at just how large the hole was when he arrived and said it should be cleaned up by the end of the week. But for Juan Meza, the owner of the popular eatery Juan in a Million, he said he’s had it “up to here” with the “hole” thing. “The same hole, over and over. Same corner. I mean come on guys! Give us a break,” he begged. This entry was posted in Pictures and tagged sinkhole, Texas, water main. Bookmark the permalink.